This year, I seem to be having a hard time transitioning to spring. I guess the relatively chilly weather and being behind on schedule does not help. Mentally, I am stuck in winter, but it is almost May already! Allers Mönster-Tidning no. 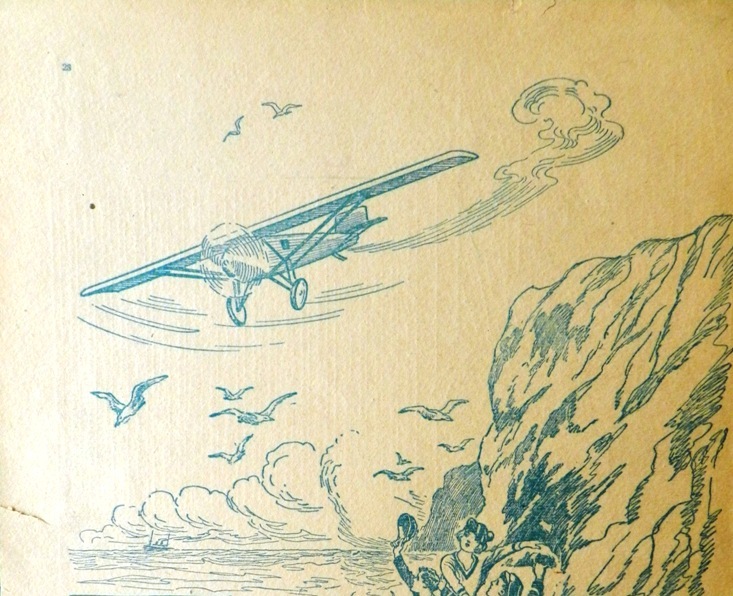 10 1934, published on the 8th of May. 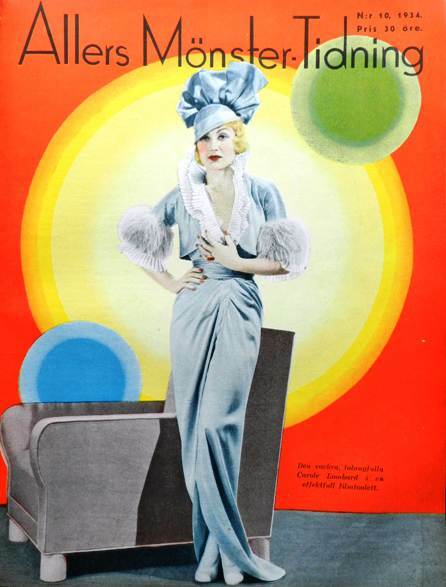 On the (awesome) cover: film actress Carole Lombard. 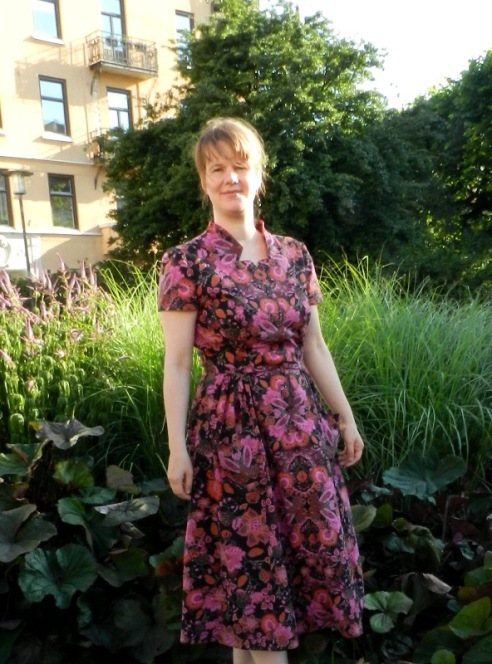 To be honest, I feel overwhelmed by the options when it comes to sewing summer clothes; so many fabrics in my stash would make nice, summery blouses and dresses. I addition, I keep changing my mind about what patterns to use. 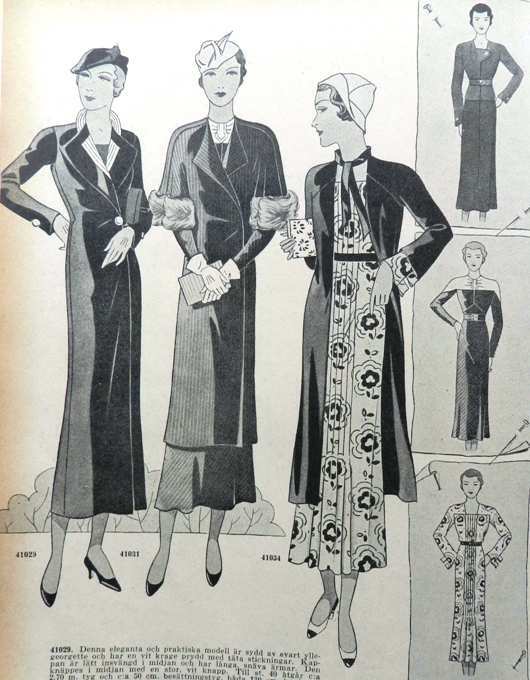 As a result, my spring/summer sewing is still waiting to happen… While I try to make up my mind, let’s take a look at the patterns and styles the fashionable woman of 1934 got to choose from. 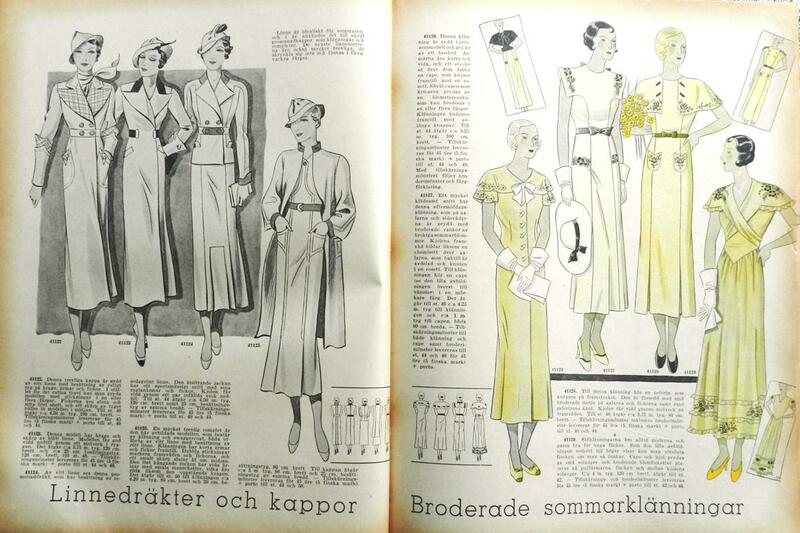 Last year, I found the entire year of 1934 of Allers Mönster-Tidning at the thrift store. The magazines are bound into hardback and overall in very good shape. 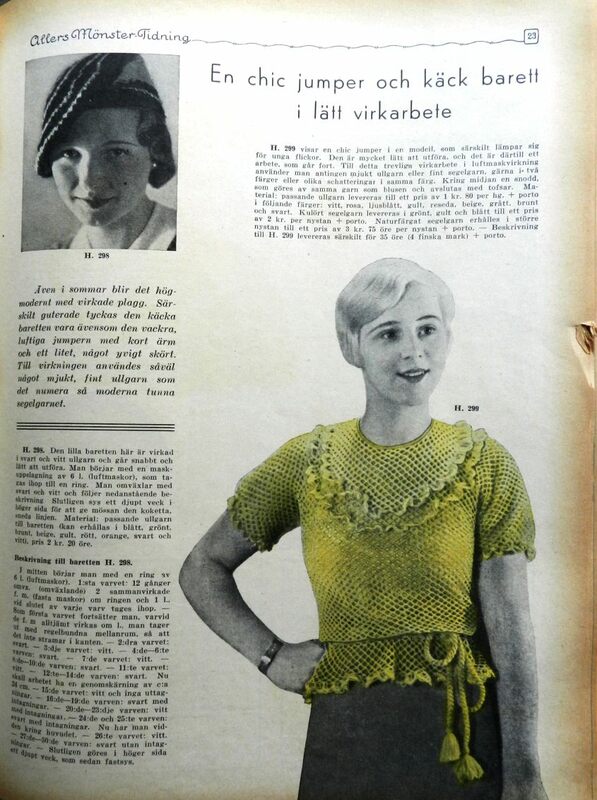 Allers Mönster-Tidning was a pattern magazine that was issued once every two weeks. 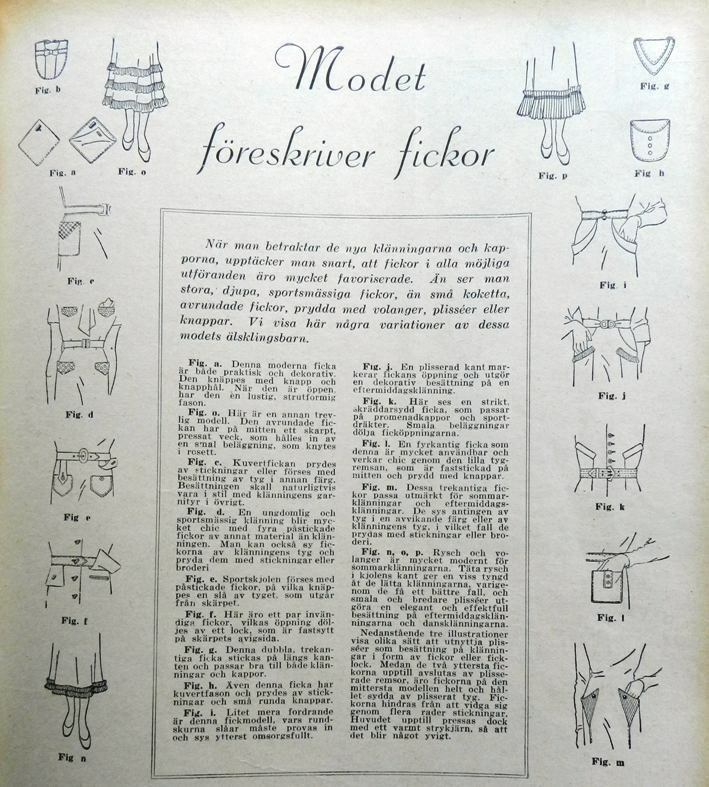 Most patterns had to be ordered, but a few models could be traced from the included pattern sheet (much like, for instance, Burdastyle). 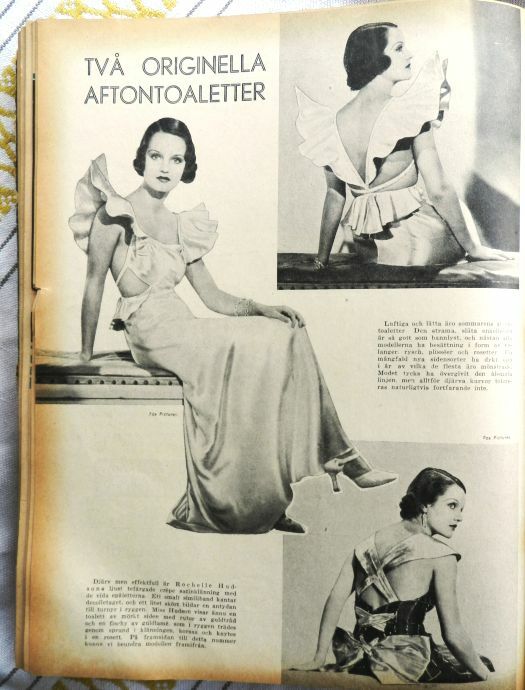 Unfortunately, no pattern sheets survive in my copies, I assume they were taken out before the magazines were bound, but just looking at the pictures is pure joy. I like the cape/coat of the woman in the middle. The floral fabric of the dress to the right reminds me of some fabric that I inherited from my grandmother and that according to my mother is very old. Now I am afraid to use it! For inspiration the magazine looked to Parisian and American fashion and movie stars. 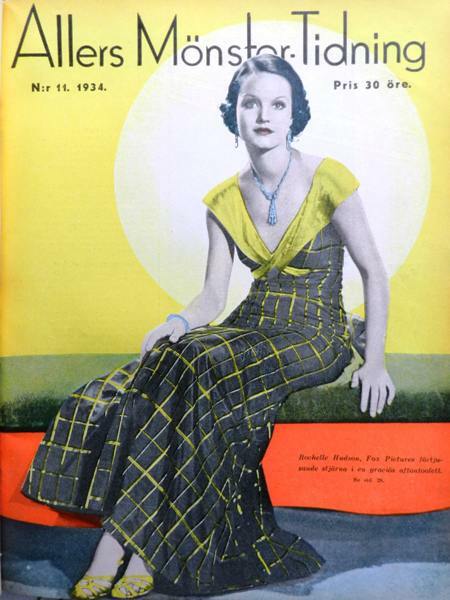 The check-patterned dress is by Jean Patou. The woman in the suit is Renate Müller (I suppose in her role in Viktor und Viktoria). 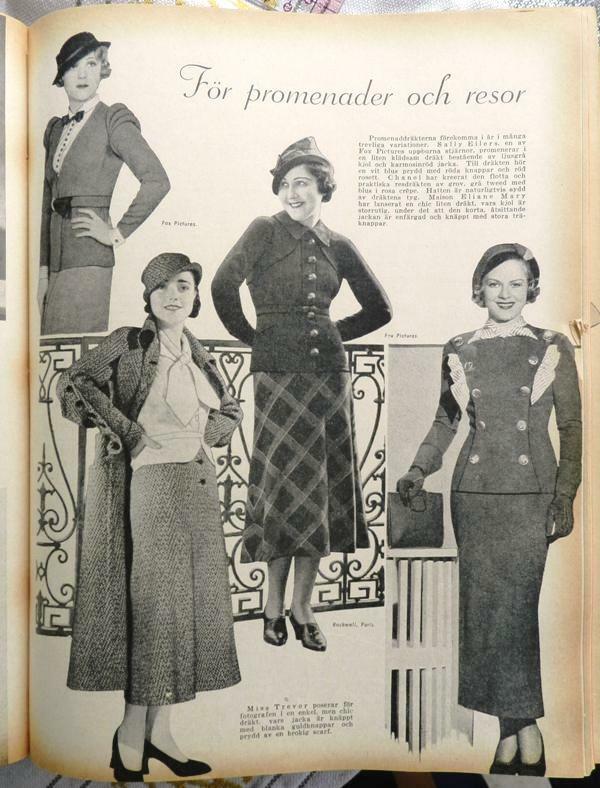 The text says that there are more women besides Marlene Dietrich who can compete with men when it comes to the art of wearing a dress suit. 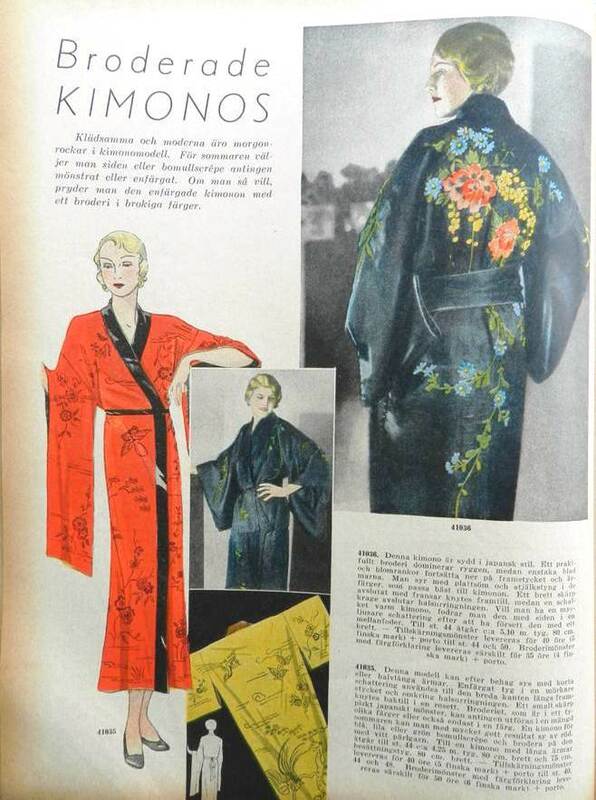 Embroidered kimonos, I guess they never really go out of style. Ideas on how to transform outfits by changing small details, for instance, by using safety pins instead of buttons on your jacket (top right) or being creative with buttons. 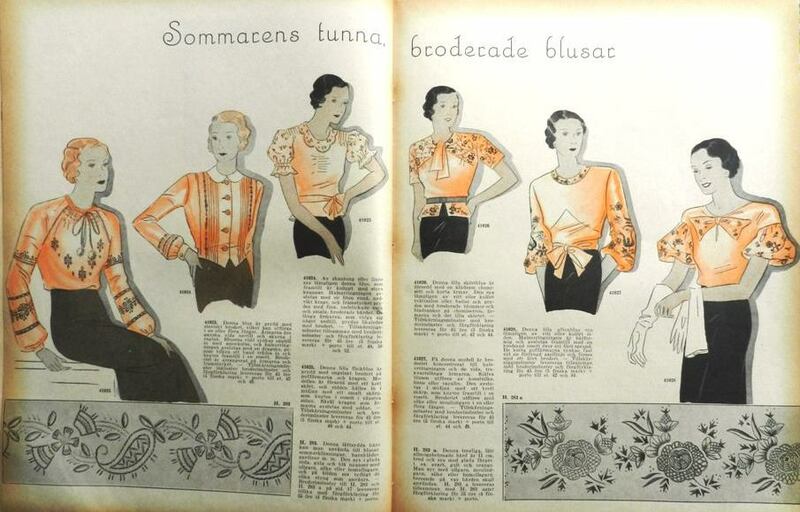 Some lovely embroidered summer blouses, I would love to have one of those! 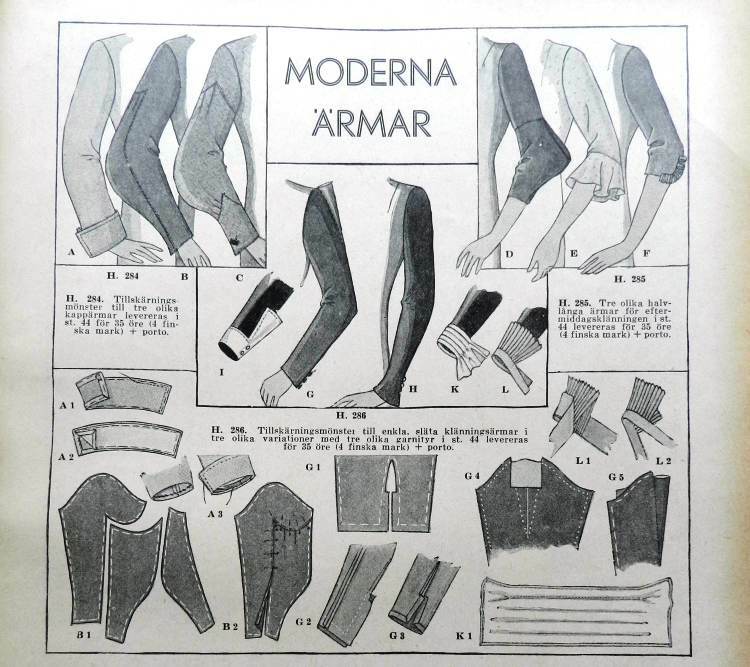 Allers Mönster-Tidning from the 22nd of May 1934. On the cover: Rochelle Hudson. Walking dresses and afternoon dresses. Sportswear! I especially like the white dress with the asymmetrical button closure and the striped beach pajamas to the right. 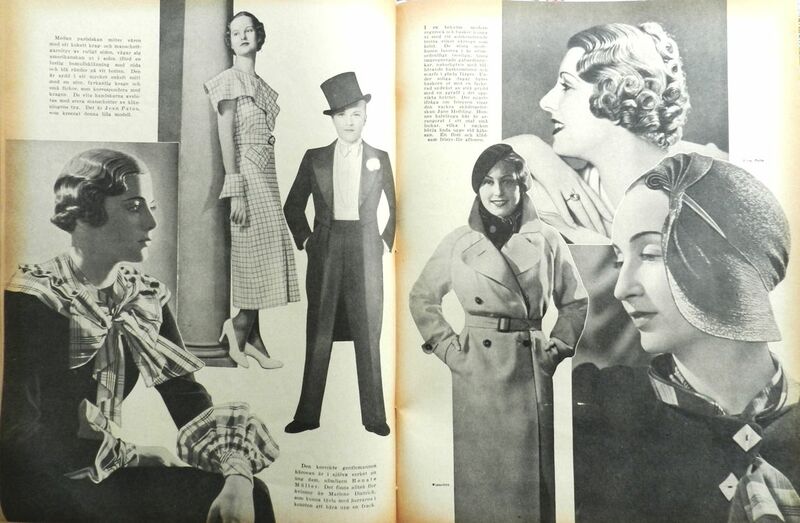 The 1930s had the best coats. Love the collar and sleeves of the coat to the left. I like the embroidered dresses with the cape-like sleeves too. “Fashion prescribes pockets.” Lots of examples of fashionable pockets. Figure k appears to be upside down. Seems like some novel idea, upside down pockets, wonder why they never caught on. I don’t crochet (and have no plans to learn anytime soon). 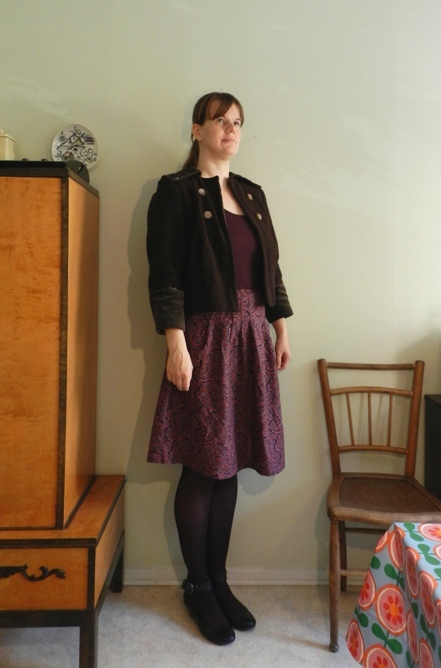 Otherwise I would perhaps give the beret a try (I love berets and had a cool crocheted one that I seem to have lost). Click on the image to enlarge and read the pattern! Rochelle Hudson once more, modelling two original evening gowns. The picture in the lower right corner shows the back of the gown she’s wearing on the cover. More practical outfits for promenades and travels. The coat with the cool buttoned sleeves in the lower left corner is by Chanel. I also love the double breasted jacket to the right that has a scarf pulled through the openings. And what a difference looking at photographs instead of the fashion drawings on which all women appear to have crazy long legs! 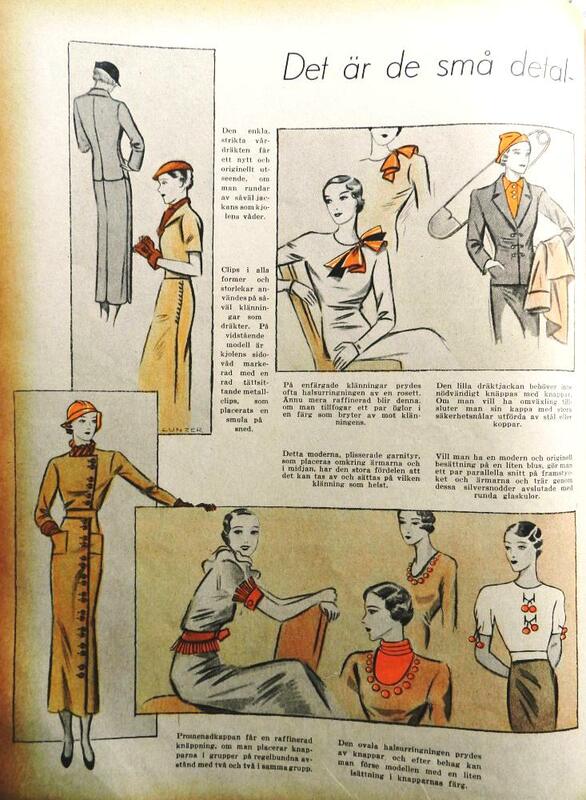 I should admit that I never was that interested in fashion from the 1930s, but this was a matter of unknown is unloved rather than a conscious choice. Browsing these old magazines has definitely given me an appreciation of the fashion of this time period. The attention to detail and creativity in particular when it comes to the shapes of sleeves and collars are amazing. 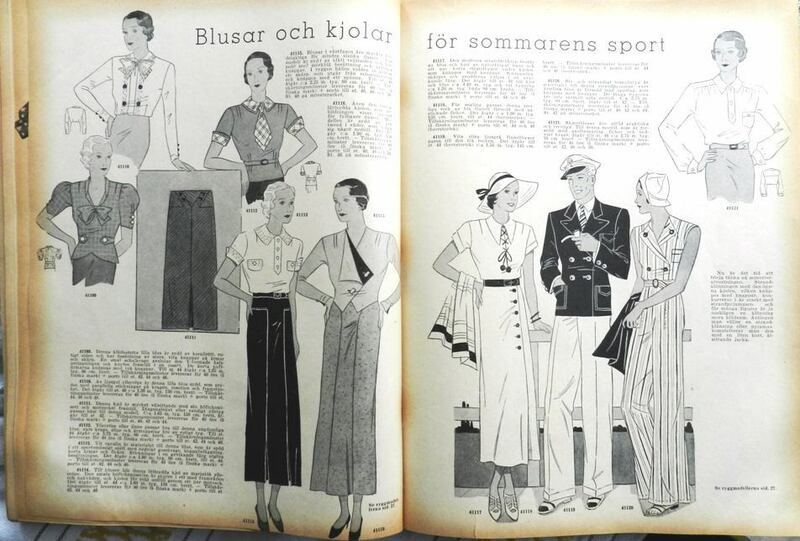 Unfortunately, I do not own any sewing patterns from the 30s, but looking at the nautical sportwear inspired me to sew a pair of wide-legged sailor pants from an older Burda magazine. I am almost finished sewing on the buttons, so hopefully I will be able to post about these soon. Thanks for sharing this…it’s lovely eye candy. 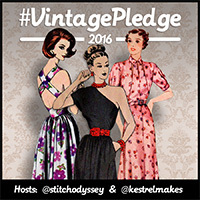 Wanting to sew more from the early to mid-30’s is on my to-do list and now I’ve got some inspiration. I love the pages on the pockets and the sleeve ideas, especially, but also the Rochelle Hudson dress! I think there’s an Eva Dress pattern very similar to Ms. Hudson’s dress. You’re welcome, Kelly, I’m glad you enjoyed the pictures! I really want to try out some early 30’s styles too, but I don’t know where to start. 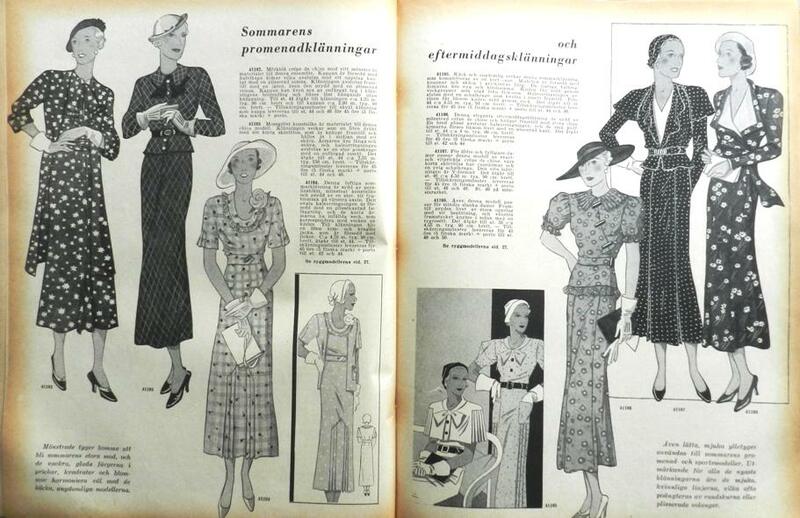 It’s difficult to find original patterns from that time period over here, so I’ll probably have to turn to reproduction patterns. Looking into Eva Dress patterns right now, thanks for the tip! 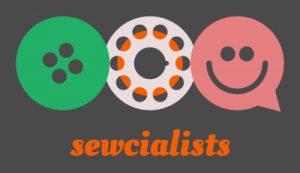 Lovely collection and great for sewing ideas!